Rich is from East Brunswick, NJ. He was a member of the program from 2011-2015, including four years in which the program finished in the top ten at Nationals. Rich served as Treasurer during his third year, and as Tournament Director during his fourth year. 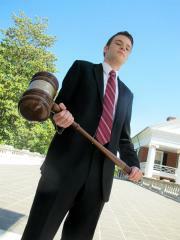 Rich was a captain during his second year, and won two attorney awards and four witness awards. Rich now works for a consulting firm in Washington, D.C.
View Rich's career individual awards by clicking here.